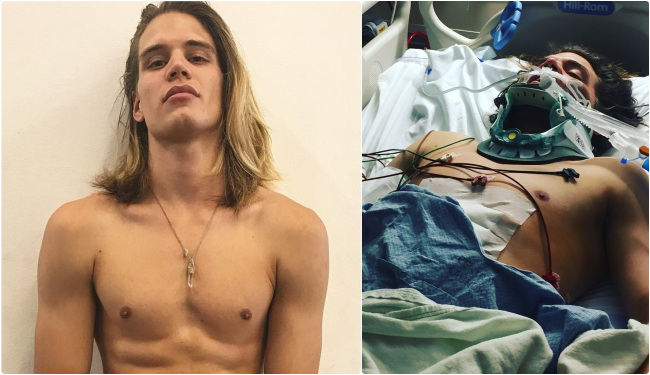 William Hawkins, a handsome New York-based model with an impressive following on Instagram, shared a very painful photo from the hospital today, after two days in the ICU, following a snowmobile accident. William Hawkins, who is represented by the Soul Artist Management agency, is originally from Memphis. He moved to New York when he was 19-years-old, in order to build his modelling career. The hospital photo shows William attached to tubes, and the second one shows a big scar on his abdomen. After a long two days in the ICU with the support from family and friends I’m up walking around. Just FYI snowmobiles are no joke. But for real, thanks for the love and support through yalls text and dms. We’re glad to see he’s slowly doing better – here’s hoping to better days and a speedy recovery.